The Cauldryn kettle/mug is a 16oz, stainless steel, Vacuum insulated vessel with a modular base that can allow for use of a variety of bases. The Vacuum insulation allows for cold beverages to stay cold for long periods of time, and hot beverages to stay hot even without power to the unit. The Cauldryn kettle/mug has an innovative lid that has two drink openings that allow for either sipping hot beverages from a small opening, or taking large drinks/pouring from a spout. The cap for the spout incorporates a pressure relief valve to make boiling water safer. Received the product on Sunday and went to use it today (Monday). The cap that opens up so you can “sip” your coffee was broken. Aside, from that, the mug does an excellent job of keeping beverages hot at the desired temperature. Still, it’s awkward to drink from the coffee side as the cover to the bottle portion of the lid gets in the way. Item is noticeably heavy and bulky, but I guess that’s the type of battery that’s needed to keep the beverages warm all day long. As a bonus, this mug has a place to charge USB devices. I will be retuning mine because of the broken lid. Not sure I will reorder as it’s heavy and awkward. Wow I am really impressed with Cauldryn. I camp a lot in remote areas, my routine is to make a pot of coffee, but by the 2nd cup its getting cold. 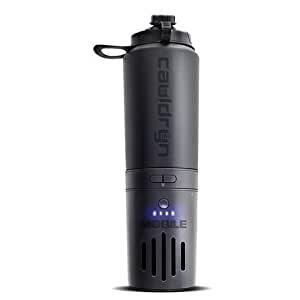 I used my Cauldryn last week to keep my coffee warm all morning, and did it for 3 or 4 days without running out of battery. So far I am really impressed. Next trip is backpacking into remote area in New Mexico, I plan to use it for freeze dried meals as well. Meanwhile its gonna be my work commute mug. I really like this thing, unique and functional. Oh and I was able to charge my cell phone on it during my trip as well. Three weeks later – I have since purchased a second Cauldryn, and have used both of them extensively. One I pretty much keep in my home/car for my daily work commute. The other I keep charged up with my camping gear. We just returned from a week of camping in Arizona, and I used mine daily, mostly for keeping my coffee warm. We had some chilly mornings. Twice I used it for food prep – one night I used it to make a Mountain House freeze-dried dinner, and another I made ramen noodles in it. I like it because its an easy way to make a quick warm meal without having to fire up the camp stove. So I still have no complaints after buying 2 of them, and keep finding ways to make it more useful. This is the bottle I have been waiting for, I drink a lot of tea and I like my tea warm. When i am in a rush in the morning i just drop my tea in this bottle and the boil mode just makes my tea while i am driving to work and I have my hot tea ready!! even at work I keep the bottle at my desk and warm my tea up whenever i need it and keep at a temperature that i prefer while charging my phone!! Although I haven’t tried it myself yet I have read that this bottle can prepare food as well!! Can’t wait to try out some of the other cool features when i go camping next time. Even-though I have got mine on indiegogo, I would probably buy couple of more as Christmas gifts for my friends. Works like a charm, and you will find unexpected applications for it. I initially thought of this strictly as an outdoors or travel product, but quickly found myself using it for a variety of household applications as well. For example, I keep water at the optimal brewing temperature for making pour-over coffee, and then adjust the setting to maintain my preferred drinking temperature. This unexpected versatility has made the Cauldryn an essential tool to simplify my daily routine. I just got this so this isn’t a long term review, but loving it so far. I am using it to keep my coffee right at the temp I want, and it works amazingly. I don’t have a need for the boiling feature, but I did try it out just to see if it worked, and it worked as advertised. I haven’t tried brewing yet, but that is next. I think I know what my wife is getting for Christmas. The only negative I have found so far is it is heavier than I expected, but not to the point of being cumbersome to use, so I didn’t take away a star. Wow, what a great product and so practical. I love camping and having my daily jolt of coffee in the morning but the traditional percolator coffee makers can be a huge pain, either from because of their bulky size or from the occasional tip over in the fire. But this product solves those issues and then some. I couldn’t believe how long it kept my coffee and the ideal temperature for me! I may have to buy a second one just for the office. Highly recommended. Great product! The mug is excellent in unexpected ways. For example, during long car rides I don’t have to pull over frequently for “refreshers” on the coffee. And it keeps my coffee warm through the entirety of my 3 hour classes! Buy it right away if you love coffee. I have already recommended it to all my friends.